THE ANCIENT NEAR EAST TODAY: Translating the Bible Against the Ancient Near Eastern Background (Robert Alter). All translations of great works are of course no more than approximations of the original, in some places happy ones, in some necessarily imperfect. But respecting the sheer physicality of the Bible’s language together with a stylistic decorum appropriate to the Hebrew diction can help readers sense something of the world quite different from ours in which the Bible was created. With lots of insightful examples. For more on Professor Alter's recently completed translation of the Hebrew Bible, see here, here, here and links. THE AWOL BLOG: Let's Read Greek. Let's do that. THIS WEEK'S DAF YOMI COLUMN BY ADAM KIRSCH IN TABLET: Better Treyf Than Sorry. ‘Daf Yomi’: To avoid conflicts of interest, Talmudic rabbis put limits on their own authority over kosher slaughter. Plus listmania! The column has usually been posted on Tuesdays in the past, but this one only appeared today (Friday). WILLIAM ROSS: 13TH INTERNATIONAL SEPTUAGINT DAY: AN INTERVIEW WITH DR. KRISTIN DE TROYER. As mentioned in the post, Professor De Troyer is a past member of our faculty at St. Andrews, and also a current honorary member. Happy International Septuagint Day! Past posts celebrating the day are here and links, here, here, and here. OLD TESTAMENT PSEUDEPIGRAPHA WATCH: Ptolemy II’s Gift to the Temple in the Letter of Aristeas (Prof. Benjamin G. Wright III, TheTorah.com). The Letter of Aristeas embellishes its account of Ptolemy’s gift of a table and bowls to the Jerusalem Temple with what Greek rhetoric calls ekphrasis, a graphic description of a thing or person intended to bring the subject vividly to the eyes of the reader. What is the purpose of this embellishment? Professor Wright has recently published a commentary on the Letter of Aristeas. And there's more on his work here. Some other PaleoJudaica posts on the Letter are here, here, and here. And an old essay of mine on it is here. The story in the Letter of Aristeas is fictional, but Ptolemy II was a real Egyptian king. For more on him and his family, see here, here, here, and here. • French Film Answers the UNESCO Jerusalem Resolution. A Jerusalem Post article from last month deals with the resolution(s) in question: UNESCO’S JERUSALEM RESOLUTIONS MAY BE REVIVED AFTER EXIT BY ISRAEL, US. PA calls for fact-finding mission into ‘Israeli aggression’ and ‘colonial plans’ (Tovah Lazaroff). For more on the withdrawal of Israel and the U.S.A. from UNESCO, see here and links. • Not as you thought: The most significant archaeological work is in the lab and not at the dig…. As opposed to salvage excavations, in an academic excavation the main core of the archaeological work is carried out in the lab and not in the field. The average yearly excavation work consists of around a month of excavation on site; the remainder of the year is taken up with studying and processing the finds in the lab. In the case of the finds from the Temple Mount Sifting Project, the challenge of processing the material is more difficult since the artifacts were not uncovered in-situ, and hence we need to apply complex statistical calculations in our research with the aim of reconstructing the original context of the more frequent finds. TECHNOLOGY WATCH: Facial recognition for coins. So to speak, yes. The digitization procedure itself is simple: Once the barcode on the particular bag belonging to each coin has been scanned beforehand, the coins are placed singly under the scanner. A push of a button suffices to start the device. A specially developed optical analysis system reconstructs the color and surface features of the historical artifacts. The scanner captures over 1000 visual features per coin. The recorded images are inter-preted as measurement data. Reference samples and color charts ensure that every image is standardized and its color space is comparable. This ensures that the image data can be compared among different institutions. In the next step, all of the measurement data are transferred to the analysis software, which uses the data to compute the digital fingerprint. This project in Germany deals with relatively modern coins. But there is obvious potential for application of the process to ancient coins and other artifacts. ZWINGLIUS REDIVIVUS: One Carnival to Rule them All: January, 2019 (Jim West). And reminder, Phil Long is still looking for a carnival host for the February 2019 edition. If you don't volunteer, he will have to take matters into his own hands. HERE WE GO AGAIN: Ancient Bible DISCOVERY: Moment police uncover copy of the early Bible in smuggling raid. DRAMATIC footage shows Turkish police uncovering a 1,200-year-old Bible during an anti-smuggling raid in Diyarbakir, before arresting the smugglers and inspecting the ancient pages. (Katie Weston, The Express). The story is also covered by Daily Sabah, but without the video. Really, how clueless can people be? This supposedly old "Bible" has no writing in it. Not a word. Just a bunch of drawings in gold leaf. It has the look of other manuscripts recovered in Turkey which have writing or drawings in gold leaf (e.g., here). I hear that there are a lot of modern forgeries in gold leaf circulating. It would not surprise me if this is one. The drawing of the man (see 0:48 on the video) looks pretty modern to me (but I am not an art historian). But some of the manuscripts are genuine early-modern artifacts in the Syriac tradition. That could be the case here too. For past seizing of smuggled manuscripts in Turkey which contain writing or drawings, often in gold leaf, see here, here, here, here and here and links. And this case also involves gold objects. More links there. As always, I appreciate that the Turkish police make it so hard for smugglers. But the media needs to exercise some restraint in covering the artifacts that are seized. They are sometimes outright fakes and so far have never been the kind of blockbuster discovery that is reported. Pseudepigraphic biblical quotations ... in the Bible? SO THERE! If Pelosi Is Guilty, So’s Jesus (Jill Marshall, Religion Dispatches). Nancy Pelosi has come under fire because her "favorite Bible verse" isn't actually in the Bible. But there's a long and storied history of misquoting the Bible, including a couple of figures you'd least expect. Yes, from time to time the Bible quotes things from the Bible which are not exactly in the Bible. Background on Speaker Pelosi's favorite (not in the) Bible quote is here and links. MAGICAL CONTROVERSY: Why Magic? Some Reflections on Terminology in the Study of Ancient Ritual (Korshi Dosoo, The Coptic Magical Papyri Blog). This post contains a good critique of the late Marvin Meyer's attempt to replace "magic" with "ritual power." I used that term for a while. That taught me not to be an early adopter. "Magic" it is, until someone comes up with something that we all agree is better. Shaily Patel also has a recent good essay in AJR on the same topic. And I have also discussed it here (scroll to the end). Today is Controversy Day at PaleoJudaica. I didn't plan it that way. That's just how it turned out. 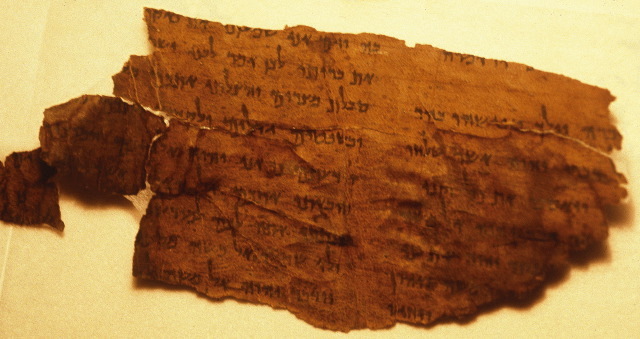 OPERATION SCROLL CONTROVERSY: Search for undiscovered Dead Sea Scrolls reveals dispute over West Bank artifacts (Michele Chabin, Religion News Service). I am not a lawyer and I take no view on what international law says about this particular case. But it does seem as though international law specialists don't agree on the issue either. This article cites and interviews a number of interested parties and experts, who have a wide range of views. For past posts on Operation Scroll, start here and follow the links. And for another discussion of the issues it raises in international law, see here. STILL MORE CONTROVERSY: Digging Up Controversy. A museum display of artifacts looted from the West Bank raises questions about the role archaeology plays in nationhood (Sara Toth Stub, U.S. News and World Report). Thought to be about 3,000 years old, the items in the new "Finds Gone Astray" exhibit are among about 40,000 objects that Israeli officials have confiscated from antiquities smugglers and looters of archaeological sites in the contested West Bank during the past 50 years. They are being put on display for the first time, an unusual move for the museum, which like most others does not display stolen items. "As a museum I believe it was not only our responsibility to display these objects, but it's our moral duty," says the museum's deputy director, Leora Berry. The exhibit, a joint project with the Defense Ministry, aims to raise awareness about the widespread theft and smuggling of antiquities in the West Bank, says Berry, and how the trade threatens the preservation of cultural heritage. But with an opening ceremony in late December that included speeches about the importance of Israel's continuing control of the West Bank, and questions emerging about the ethics and legality of displaying the confiscated objects, the exhibit also offers a window into the growing role that archaeology is playing in the Israeli-Palestinian conflict. For more on the "Finds Gone Astray" exhibition at the Bible Lands Museum and the debate over it, see here and links. SO MANY CONTROVERSIES TODAY: Jerusalem's Controversial Cats. In Israel’s divided city, a new split emerges over what to do about stray cats (Sara Toth Stub, U.S. News and World Report). In a city holy to three religions, with strong political and geographical divisions tied to the Israeli-Palestinian conflict, another issue is driving a wedge between residents: what to do about Butter, and the hundreds of thousands of street cats like her. The discussion intensified recently after the city's new mayor, Moshe Lion, announced in late January that the municipality would spend 100,000 shekels ($27,692) a year to buy food for street cats and set up designated feeding stations. The project comes as dumpsters have been replaced in some areas by underground trash containers, effectively reducing a key source of food for street cats. "Because there are so many cats, it's become so emotional in both ways," says Idit Gunther, a veterinarian and lecturer in veterinary medicine at Hebrew University of Jerusalem. "You have people who spend their whole salary on feeding them, then you have people who think of the cats and the feeders in a bad way. And whether you are a cat lover or a cat hater you can see that something needs to be done." Many tour guides and Jerusalem residents blame the British, who ruled the city between 1917 and 1948, for bringing cats to the city via their ships. But the felines have lived in Jerusalem for thousands of years, Gunther says. In fact, the genetic makeup of most of Israel's street cats shows they are directly descended from the original African cat domesticated by the ancient Egyptians, and do not include genes of any wild European cat species, she says. For more on recent studies of ancient cat DNA, plus other fun facts about ancient cats, see here. In the Baylor Handbook on the Hebrew Bible's most widely used volume, Dennis Tucker provides a foundational analysis of the text of Jonah. This second edition of Jonah is distinguished by the detailed and comprehensive attention paid to the Hebrew text. Tucker's analysis is a convenient pedagogical and reference tool that explains the form and syntax of the biblical text, offers guidance for deciding between competing semantic analyses, engages important text-critical debates, and addresses questions relating to the Hebrew text that are not always addressed in standard commentaries. Beyond serving as a succinct and accessible analytic key, Jonah also reflects the most up-to-date advances in scholarship on Hebrew grammar and linguisticsâ€specifically, this edition relies on the methodology of generative grammar utilized in other recent volumes in this series. This handbook proves itself an indispensable tool for anyone committed to a deep reading of the Hebrew biblical text. CINEMA: [Exclusive] Mythical Monster Wreaks Bloody Havoc in Clip from ‘The Golem’ (John Squires, Bloody-Disgusting.com). Yes, that really is the name of the website. If you're thinking about watching the new The Golem movie, you can view a couple of minutes in this clip which are not in the trailers. But I link to it with a content warning: the clip contains graphic violence, so viewer discretion is advised. Background on the movie is here and links. And follow the links back for many more posts on past and present manifestations of the Golem legend. This article says that The Golem opens tomorrow today (5 February), although an earlier one said 1 February. Perhaps it depends on the country. THE AWOL BLOG: Open Access Journal Backfiles: Journal for Semitics. All articles from 1998 through 2003 are available online for free. Noted a few years ago, but the AWOL link for that post is now gone. OLD TESTAMENT PSEUDEPIGRAPHA WATCH? Nancy Pelosi Keeps Quoting Her Favorite Bible Verse. The Mystery: It’s Not Actually in the Bible (Ruth Graham, Slate). No, it isn't, but it is sort of a modern midrashic expansion of one or two biblical verses. The article discusses some possible inspirations. And it notes that the issue of the Speaker's quote also came up back in 2008. I posted on it then here and here. THE COPTIC MAGICAL PAPYRI BLOG has been blogging up a storm with, inter alia, a six-part series on the papyri in their late-antique Egyptian religious context. "While such mentions of traditional deities are relatively rare in Coptic texts, those that we do find are very interesting for our understanding of the development of the Coptic magical tradition, and of its ability to transmit and preserve knowledge of cults which had been lost in previous centuries." "Here we see one strange outcome of centuries of Hellenic culture in Egypt, the Greek gods as the secret names of the Christian devil." Includes a Lovecraftian exchange of letters between two Manichean magicians. "If this is the case, then magical and gnostic texts both provide us with independent vantage points on religious beliefs and practices beyond the narrowly defined orthodoxy." A magical papyrus that appears to make use of Sethian Gnostic myth and ritual. "To the composer(s), compiler(s), and copyist of this text, orthodox Christianity offered possibilities for protective ritual practices just as rich as Egyptian or Greek 'paganism', or the complex cosmologies of 'gnosticism'." CHURCH SLAVONIC WATCH: The open-access journal Scrinium: Journal of Patrology and Critical Hagiographa has a new issue out (14.1) which has a large section of articles on Slavonic biblical apocrypha and pseudepigrapha. HT AJR. Cross-file under New Testament Apocrypha Watch and Old Testament Pseudepigrapha Watch. YAZIDI WATCH: Nobel peace prize goes to campaigners against sexual violence. Gynaecologist Denis Mukwege and Yazidi campaigner Nadia Murad are jointly awarded (Jason Burke, The Guardian, 5 October 2018). Murad said: “I share this award with all Yazidis, with all the Iraqis, Kurds and all the minorities and all survivors of sexual violence around the world. I am very surprised that this story didn't show up in my search feeds earlier, but better late than never. PaleoJudaica has been following the Yazidis — an Iraqi minority group that has a Gnosticism-themed religion with ancient roots — before, throughout, and after their brutal persecution by ISIS in 2014. I mentioned Nadia Murad and her lawyer, Amal Clooney, in 2016. Belated congratulations to Ms. Murad (and to Dr. Mukwege) and to the Yazidi community. For other posts on the Yazidis, start here and follow the links. A recent article on them in the Jerusalem Post is here: THE PLIGHT OF THE YAZIDIS. Many Yazidis feel that the world has abandoned them to suffer alone (ANTHONY AVICE DU BUISSON). HARVEY N. BOCK: Is the Autumn Ingathering Festival at the Beginning, Middle, or End of the Year? (TheTorah.com). The Feast of Ingathering is “at the tzet (צֵאת) of the year” (Exod 23:16). This phrase is generally translated as “the end of the year,” but a closer look at the meaning of the Hebrew verb in biblical Hebrew suggests it may mean the beginning. BIBLE HISTORY DAILY: I Am Ashurbanipal at the British Museum. Exhibit: I Am Ashurbanipal, King of the World, King of Assyria (Cathleen Chopra-McGowan). I Am Ashurbanipal, featured at the British Museum in London through February 24, 2019, is a magnificent exhibition. The display’s namesake would be proud. Some past posts involving Ashurbanipal are here, here, and here. PROF. RABBI MARTIN LOCKSHIN: Does the Torah Differentiate between an Unpaid and a Paid Bailee? (TheTorah.com). For the first nine hundred years after the writing of the Mishnah in the early third century, Jews thought that laws about bailees or custodians (שומרים) in the Mishnah and in the Talmud corresponded closely to the plain meaning (peshat) of the Torah. But in the Middle Ages, Rashbam challenged that assumption, proposing an understanding of the Torah that contradicted Jewish law. THE ETC BLOG: Jewish and Christian Books in the First Millennium in Indiana (Peter Gurry). THE AWOL BLOG: The Gospel of Thomas Resource Center. A useful site by Michael W. Grondin. Cross-file under New Testament Apocrypha Watch.